With fashion shows being live streamed, selfies being uploaded instantly to Instagram, the thirst for an instant ogle, it has become more important than ever for those deigned photogenic enough for the front row to dress to impress. It’s not like they didn’t before, but since the Frow has blown up it’s less fashion editors being placed there to take diligent notes, and more celebs dumped there to add extra pizzazz and publicity. London Fashion Week is over (Milan has now taken up the baton) but the stars came out in their numbers to celebrate the great and good of British design. I do like a good goo at the London Frow; to see the often chilly interactions between the up-and-comers and the old pros, the cool It-girl looks – it’s my favourite of the fashion weeks for street style – and the caught-in-the-moment gurns of the plebs in the back. Henry Holland always gives good Frow because he invites all his besties along. Poppy Delevigne is working that fun fur, as is Daisy Lowe, and it’s good to see Nicola Roberts back on the scene. And hark! Daisy has pulled out her black tights and boots, it truly is autumn, hurray! Another Frow full of friends, Erin O’Connor just wants to get on with it. I love her willowy look, and that print is such an unusually autumnal choice. Laura Bailey is still rocking those flares, and that geometric jumper is to die for. Poppy and Daisy have popped up again (there are a number of frequent Frowers), and they are both looking lovely in their minis. 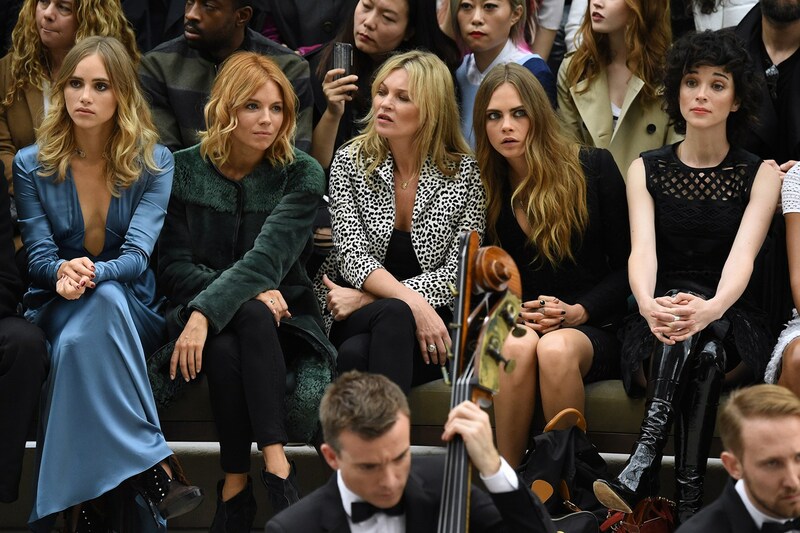 There are always rumours floating around about who Kate Moss is thick with, but here she is cosying up to Sienna Miller and Cara Delevigne and having a whale of a time at Burberry. Suki Waterhouse has gone down a seventies, plunging route, but isn’t the colour beautiful? Kate is proudly wearing her print (see how to make it work for you here) and couple Cara and Annie (aka St. Vincent) are coordinating cutely. How are those seated further back ever going to be seen behind Laura’s huge sunglasses? Whoever said you should never wear necklaces with a poloneck has been here proven wrong, and Lauren Santo Domingo keeps it casual but chic in skinnies, black pointy flats and black top. The London look is the most accessible for us to emulate right now with our climates being more or less the same. I think I’ll be breaking out the sandals, wide leg pants and chunky jumper thing soon, and will maybe take inspiration from the other stylish sistas and get some print knits in my life. Have you gotten any tips from those in know?